The Governor of PaxLair often has many thoughts about PaxLair and the Community at large. Read what the Governor has been ruminating about. Winfield's rather old biography is here (2000). Governor Winfield introduces the topic of Loyalties for a monarch in the Realm. PaxLair Statehood is unique with three cities and many guilds of differing attitudes about good and evil and for or against "saving the Realm from evil". Therefore, Governor Winfield offers ideas and options that might also be used by other towns, cities, and guilds in the Realm. The PaxLair [mechanical] Alliance has grown once again to be a great community of friends and companions built out of Respect for one another. This is absolutely wonderful. Any time in the Realm, people in the PaxLair Alliance on Chesapeake can use the [Alliance Chat System] to quickly reach people. If you are in one of these guilds, or your want to join one of these guilds to "connect" yourselves to the PaxLair Community with [real time communication] while in the Realm, just come to one of the Tuesday night PaxLair Meetings or visit the PaxLair Forums. This [mechanical] alliance list does NOT mean we are not allied with other guilds within the Realm, such as United Tamers of Britannia. We work around the alliance connection issues and take ourselves one step above [god-given mechanics] by staying in very close contact through "other means" with our total list of friends and allies. A true alliance is a group of people with similar goals and intentions. We support each other. We of PaxLair very much appreciate the friends we've made throughout the years and into the future. Thank you my friends. Dragonspeed on your quests within the Realm. See you in the Realm. I am honored to humbly announce the 10th Anniversary of PaxLair on Chesapeake. PaxLair was founded as a player community on January 19, 1998. Our 10th Anniversary Schedule is published here. 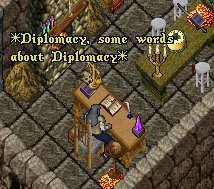 A long time ago in what seems only yesterday for many of us, we saw a great Realm come into existence called Ultima Online. This Realm immediately captured our fascination even before we could actually met each other "face to face". When the gods created the world for us, we jumped right in to discover fantastic sights, beasts, dungeons, and treasures beyond belief. As we walked, rode, and gated throughout the Realm we met each other. We found each other in dungeons, in shops, and even in boats on the high seas. We teamed up in guilds and saved up gold for houses we could care for and store our belongings, lest a thief passed by who we quickly attempted to dispatch into the abyss. Camaraderie and friendship became the "watch-words" as we worked together, and against each other. People started to master their skills and the people and gods weRe happy. Then came the early days of the player-towns--a group of houses formed by a guild or group out of the necessity for a common location to meet one's goals or to experience the Realm in a much broader way. PaxLair was and is one of those early player-towns. Formed on Chesapeake Shard by The Band guild, it became noted as a crossroads and a hot-spot for many travelers and peoples. It was January 19, 1998 when the first building and the first brick were laid down in a sleepy meadow west of the Compassion Shrine on what is now called Felucca, Chesapeake. Various people flocked to this new town called PaxLair in the months to come with numbers estimating at around 300 interested and involved people. The gods came too and helped PaxLair work with so many people. It was fascinating to be a part of this interaction...and at times to see the blood spilled in the town streets. Soon a working government was needed to control the bloodshed and to help organize the people. I became the first Mayor of PaxLair in mid-1998 and still continue to be involved, now as the Governor of PaxLair. PaxLair has became a Statehood of several player-cities on Chesapeake. PaxLair is much more than a place...a group of buildings...a guild of people...a government structure of mayors and their councils. It is a vision for persistent cooperation and opportunity for people taking their activities in the Realm two or three steps beyond defeating monsters or other people. It is a community spread across the shard and the Realm (at times) for people to meet, greet, and have fun. PaxLair has always been a crossroads not just as a place, but as an idea. Many people come and go through PaxLair; some stay for years on end; others come back to their roots at a future time. We are 10 years old on January 19, 2008. We have not been dormant. We have not collapsed. For some reason we continue to trudge along trying new things and old things. We are not about size or numbers. We are about quality of life in this Realm. And in this regard, we are continually inspired by all the player-towns in the Realm who accomplish so much. For together, we are one community...one unified peoples in a Realm always full of intrigue and wonder. I humbly invite you to come to PaxLair in our cities during our 10th Anniversary. We have many events planned, but most importantly...we have an opportunity to meet you. Our 10th Anniversary Schedule is published here. There's a lot of information to read and understand regarding the Hearing of Law on the PaxOku Decree. I seek to keep the final hearing on August 6th short, focused, and relevant. I'd like to point out a few things that help me make a ruling. PRIMARY QUESTION RAISED TO ME - Is the PaxOku Decree consistent and legal with PaxLair Statehood laws and decrees? Governor Winfield reflects upon the early days of the Realm when people built towns and establishments. He looks at two reasons why there was so much teamwork, as related to building these towns. [Out-of-Character] The player behind Governor Winfield offers suggestions on how to set times and announce events on the Stratics Chesapeake Calendar. Proper use of the time-zone features on the Stratics Forums, and thus the Calendar, will ensure people can arrive at an event at the right time. Chesapeake players typically uses U.S. Eastern Time as its standard. Read more for the descriptions, screen shots, and sample event announcement. As the PaxLair Community continues to draw interest around the Realm, Mayor Winfield presents his thoughts about the different levels guilds may become involved in within the PaxLair Community. These levels are Allied-Guilds, Citizen-Guilds, and Cities or Outposts. Mayor Winfield offers some thoughts on key ingredients to develop stable, long-term communities. Communities can be guilds, establishments, towns, cities, groups of guilds, and more. Mayor Winfield prepares for a two-week journey. He reflects on taking time away from the Realm when so much is happening, but is still good for the mind and spirit to balance a busy life. More ideas from more people! Sitting on one of his favorite logs in a favorite fishing spot, Mayor Winfield writes about his impression of the rapid growth in people creating ideas in the Realm. Winfield just returned from a trip to the Underworld with The Gatekeeper. The Mayor can't say much about the details of the trip, but he says a few things about The Gatekeeper. PaxLair and the Realm are constantly changing in one way or another. Mayor Winfield expresses his views about how change creates challenges and we should embrace the challenges. A new threat has started in Sosaria. Mayor Winfield writes about how the people and leaders of the community can rally together to combat these new threats. Mayor Winfield writes about the start of the 2006 Chesapeake Olympics and the start of his most recent Diplomacy Mission. The Diplomatic Mission will take him and Minister of Diplomacy Jasper to the far reaches of the Realm. Mayor Winfield describes changes to the PaxLair Alliance, offering more freedom and opportunities to guilds of PaxLair. With the conclusion of the 8th Anniversary of PaxLair, Mayor Winfield relates to his announcement that he will remain as the Mayor of PaxLair for another year. He also describes his emotion looking back on the past years. On January 19, 2006 which marks the 8th Anniversary of PaxLair, Mayor Winfield gives a speech in PaxOku reflecting on the past, present, and future. The 8th Anniversary starts and Mayor Winfield writes about his belief of an even better year to come. Port Baldmor, a pirates island on Trammel, catches the attention of Mayor Winfield. The Time Lord is coming! Mayor Winfield writes about how every person can make a difference and time is always running out. A time is upon us when we think of family and friends. Mayor Winfield describes personal thoughts on people working together to enjoy each other's company.